On behalf of the whole parish of Finedon may I invite you most warmly to step over our virtual threshold. You will find within our contact details and details also of forthcoming services and events here at St Mary’s. 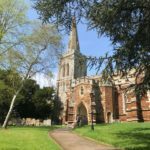 We are, of course, the parish church not only for the those who worship here but for everyone in Finedon, and the social calendar is almost as busy as the ecclesiastical calendar. Whatever you seek – friendship, community, something to challenge and stretch you, something to give you comfort and peace, the love of Jesus Christ, or simply the satisfaction of curiosity – you are most welcome to step over our real threshold too and see what we have to offer. 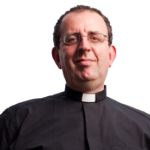 Yours in Christ, Fr Richard. The church of ST. MARY-THE VIRGIN consists of chancel, north and south transeptal chapels, clearstoried nave of four bays, north and south aisles, south porch, and west tower. The tower is surmounted by a lofty spire and the porch has an upper story. There is a modern vestry on the north side of the chancel. Of the original 12th-century building nothing remains except the font, the church having been entirely rebuilt at the beginning of the 14th century. With the exception of the tower and spire it is all of one date, and is one of the finest examples in the county of a church of this period. The tower and spire were erected about fifty years later. The whole building is therefore substantially of one style and it preserves a unity in design which gives it particular distinction. The position of Organ Scholar at St Mary’s, Finedon is currently vacant. If you are interested please contact the Director of Music, Jonathan Harris (email music@stmarysfinedon.co.uk) or come along to a service and introduce yourself. The position is fairly flexible and can include free organ lessons, regular or occasional playing in services, and training in choral conducting. 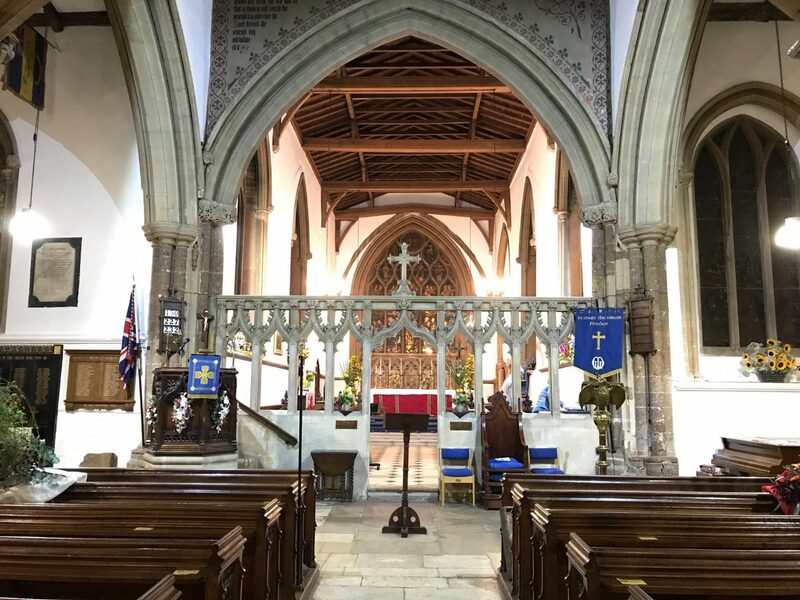 Prospective applicants should, as a minimum, be aspiring to play occasionally for parts of our services (Sunday morning 9.30am services and our monthly choral evensong which is 6pm on the first Sunday of the month). Some keyboard ability is required but as important is enthusiasm for the organ. 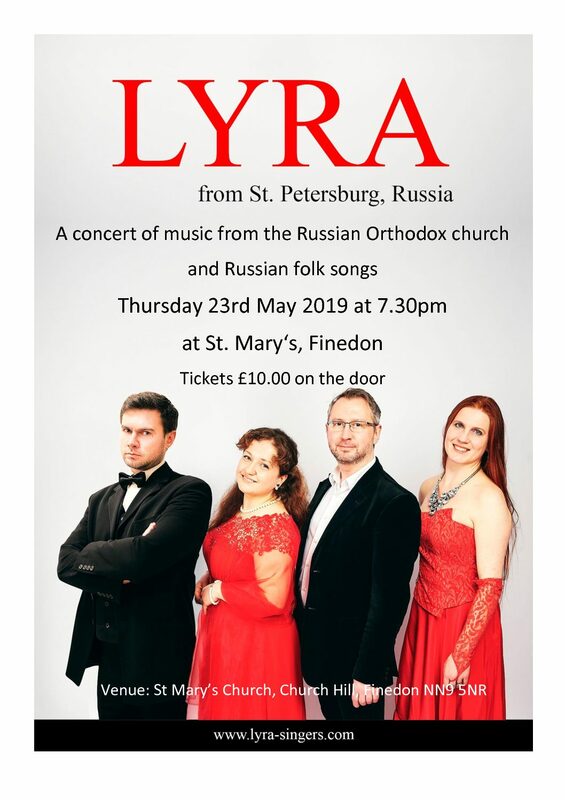 Lyra Vocal Ensemble from St Petersburg singing music from the Russian Orthodox Church and Russian folk songs.